To have a race you need at least two competitors and right now there is only one. Hon. Verlyn Olson has announced he is prepared to step up to the starting line for the race slated to take place on February 21st, 2015. On January 13th, 2015, the Progressive Conservative Association of Alberta opened up candidate nominations in 35 Alberta constituency associations, of which Wetaskiwin-Camrose was one. 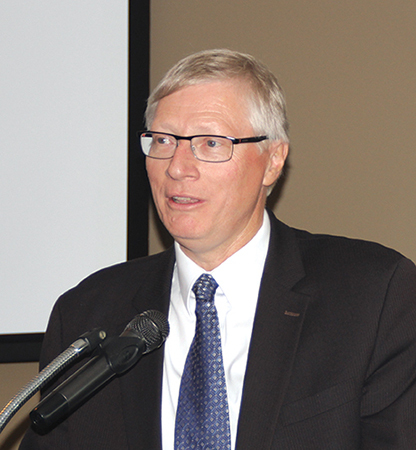 If a second or third competitor does not come forward, Olson will be acclaimed as the candidate to represent the Progressive Conservatives in the provincial general election. PC Alberta President Terri Beaupre has stated, “I’d like to make clear to all of our supporters, the media, and the public that these nominations will be fully open. Our members in each constituency will select who they want representing them in the next general election.” Each constituency association will decide on how long the nomination period and campaign period will be open following the guidelines set out in the PC Alberta constitution. In a brief and unplanned address at the beginning of his Open House on Wednesday, January 7th, 2015, Minister Olson was quite candid about chaotic times they were under-going in the Legislature with low oil prices and economic uncertainty, leadership changes, Cabinet shuffles, by-elections, some controversial legislation and of course, the floor crossings. He did nevertheless, assure the guests that however distracting the chaotic times were, in the midst of it all the focus remained on Constituency and Ministerial responsibilities. Now, he takes his comments one step further when announcing he will be letting his name stand as a P.C. candidate in the Wetaskiwin-Camrose constituency. “I feel fortunate to have learned more about the issues that are important to constituents and have worked to advocate for them as their MLA. I would like to continue with this work. Therefore, I have decided to stand for nomination as the PC candidate in the next provincial election. While this has been a very rewarding job, it has also been very demanding and I especially want to thank my family for their ongoing support. Although there has been a great deal of speculation when the next provincial election will take place, there are many noticeable signs pointing to the spring of 2015. The last provincial election was held on April 23, 2012. The next election is not due until the fourth calendar year thereafter, or between March 1 and May 31, 2016. However with prominent Ministers and MLAs such as Horne, Horner, Griffiths, Jablonski, Hancock and Hughes announcing resignations well before their terms are up (March 1 – May 31st, 2016), and the PC Party announcing a deadline of March 15th to have candidates nominated in all 87 constituencies, it seems the starting gun is being raised for a race in the spring of 2015. Interesting times ahead for the Wetaskiwin-Camrose constituency including two pending races – the P.C. candidacy followed by the next provincial election.